Background: Untreated, obesity hypoventilation is associated with significant use of health care resources and high mortality. It remains unclear whether continuous positive airway pressure (CPAP) or bilevel ventilatory support (BVS) should be used as initial management. The aim of this study was to determine if one form of positive pressure is superior to the other in improving daytime respiratory failure. Methods: A prospective randomised study was performed in patients with obesity hypoventilation referred with respiratory failure. After exclusion of patients with persisting severe nocturnal hypoxaemia (Spo2 <80% for >10 min) or carbon dioxide retention (>10 mm Hg) despite optimal CPAP, the remaining patients were randomly assigned to receive either CPAP or BVS over a 3-month period. The primary outcome was change in daytime carbon dioxide level. Secondary outcome measures included daytime sleepiness, quality of life, compliance with treatment and psychomotor vigilance testing. Results: Thirty-six patients were randomised to either home CPAP (n = 18) or BVS (n = 18). The two groups did not differ significantly at baseline with regard to physiological or clinical characteristics. Following 3 months of treatment, daytime carbon dioxide levels decreased in both groups (CPAP 6 (8) mm Hg; BVS 7 (7) mm Hg) with no between-group differences. There was no difference in compliance between the two treatment groups (5.8 (2.4) h/night CPAP vs 6.1 (2.1) h/night BVS). Although both groups reported an improvement in daytime sleepiness, subjective sleep quality and psychomotor vigilance performance were better with BVS. Conclusions: Both CPAP and BVS appear to be equally effective in improving daytime hypercapnia in a subgroup of patients with obesity hypoventilation syndrome without severe nocturnal hypoxaemia. Trial registration number: Australian Clinical Trials Registry ACTRN01205000096651. Patients with obesity and daytime hypercapnia were recruited from the Sleep Disorders Clinic and Sleep Investigation Unit at Royal Prince Alfred Hospital. Inclusion criteria included: (1) obesity with a BMI ⩾30 kg/m2; (2) stable awake compensated respiratory failure with arterial carbon dioxide tension (Paco2) ⩾45 mm Hg and pH ⩾7.34; (3) the absence of any significant respiratory, neuromuscular or other disorder that could account for the hypercapnia; (4) ratio of forced expiratory volume in 1 s/forced vital capacity (FEV1/FVC) ⩾70%; (5) no major psychiatric illness that would affect the patient’s ability to participant in the study; and (6) not currently being treated with positive pressure therapy. Based on clinical consensus and safety concerns, a priori criteria were set so that patients who displayed significant and prolonged desaturation or significant carbon dioxide retention during an initial CPAP trial were excluded from the study. These criteria were: (1) oxygen saturation remaining below 80% continuously (>10 min) in the absence of frank apnoea; (2) an acute rise in transcutaneous carbon dioxide pressure (Tcco2) (TCM3, Radiometer, Copenhagen, Denmark) during episodes of rapid eye movement (REM) sleep ⩾10 mm Hg; or (3) an increase in afternoon to morning Paco2 of ⩾10 mm Hg in those patients with an awake Paco2 >55 mm Hg. Figure 1 outlines patient screening and recruitment for the study. Figure 1 Flow diagram outlining screening and recruitment of patients. CPAP, continuous positive airway pressure; BVS, bilevel ventilatory support; ABG, arterial blood gas. Following routine baseline sleep studies, spirometry and arterial blood gas measurements, a CPAP titration was performed. Those patients meeting the above criteria for significant and prolonged desaturation or significant carbon dioxide retention during the initial titration night at best CPAP pressures were excluded from randomisation. The remaining patients were then randomly allocated to either longer-term CPAP or BVS using opaque sealed envelopes. Baseline evaluation performed prior to the CPAP titration night included anthropometric measurements and quality of life and sleep questionnaires, cognitive tests and psychomotor vigilance testing performed according to standard methods. Full details of these measurements and titration of positive pressure therapy are outlined in the online supplement. Patients were discharged home on positive pressure therapy for a 3-month period. At follow-up, baseline measurements were repeated and a CPAP titration was again performed to determine the patient’s current response to treatment. The results of this study, along with arterial blood gas tensions and compliance with treatment, were then used to determine the patient’s longer term home treatment. The primary objective was to determine if there was a difference in change in daytime carbon dioxide levels between two different forms of positive pressure therapy—CPAP and BVS—after a 3-month period of treatment. The secondary objectives included compliance with treatment, changes in quality of life and neurocognitive function. An a priori power calculation suggested that a sample size of 13 in each group would be needed to detect a difference in the mean change in arterial carbon dioxide of 7 mm Hg with a power of 80% and a p value of <0.05. Comparison between normally distributed parametric data was made using paired t tests for within-group analysis. The Mann-Whitney U test was used for non-parametric data or non-normally distributed variables as indicated. The level of significance was taken as p<0.05. Analyses were performed using a commercially available statistical software package (SPSS Version 14.0; SPSS, Chicago, Illinois, USA). Of the 85 subjects initially screened, 37 were excluded from the study. Reasons for exclusion are given in fig 1, with acute respiratory failure the major reason. Three further patients were invited to participate in the study but declined: two felt they would not be able to return for follow-up and one did not want to participate. This left 45 patients available for enrolment. Nine patients met the a priori criteria for outright initial CPAP failure and were treated with BVS on clinical grounds. The remaining 36 patients underwent randomisation, with 18 being allocated to CPAP and 18 to BVS. Baseline characteristics of the two randomised groups did not differ, although fewer women were randomised to the CPAP group (table 1). Likewise, there were no significant differences between groups with regard to sleep architecture, oxygenation or total respiratory disturbance index (table 2). The initial response to CPAP titration is outlined in table 3. In 7 of the 18 patients randomised to CPAP the initial response to CPAP was categorised as acceptable, while in the remaining 11 patients the response was incomplete with the respiratory disturbance index remaining >10 events/h or sustained oxygen desaturation >80% and <88% on best pressure. 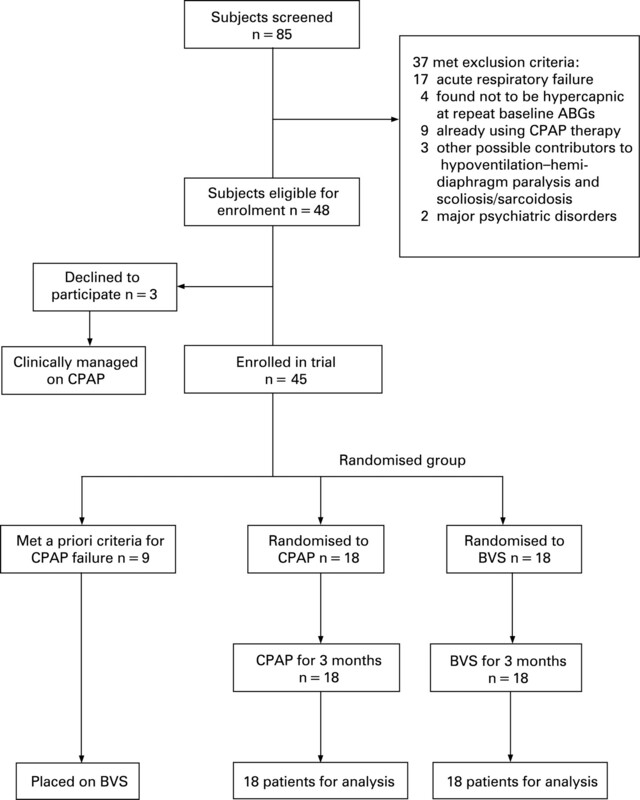 In the group randomised to BVS, the initial response to CPAP was acceptable in 11 patients. Mean home bilevel pressures used for the BVS group were 16 (2) cm H2O inspiratory positive airway pressure and 10 (2) cm H2O expiratory positive airway pressure, with all patients using a spontaneous mode of support. A full-face mask was used for home use in 13 patients (5 allocated to BVS and 8 on CPAP) while 23 patients used a nasal mask (13 on BVS and 10 using CPAP). In 7 patients (3 in the CPAP group and 4 in the BVS group) initial daytime and/or nocturnal oxygen (flow 1–2 l/min) was required to prevent Sao2 falling below 88%. Follow-up data were available for all 36 patients randomised to treatment. At review, both groups had experienced a reduction in weight of around 5 kg, improvement in daytime Paco2 and a reduction in bicarbonate. However, there was no difference between treatments for any of these parameters (table 4). The mean number of hours of nightly positive pressure use was not affected by the type of treatment to which the patient was allocated, with both groups using treatment more than 5.5 h/night. Subjective daytime sleepiness improved with treatment, with no difference between groups (table 2). However, only those patients randomised to BVS experienced a significant improvement in subjective sleep quality (table 4). Within-group improvements in the 36-item Short Form Health Survey (SF-36) dimensions of Physical functioning, Role-physical, Vitality and Social functioning were seen in the BVS group, while only Vitality improved in the CPAP group (table 5). No differences in treatment effect were seen between the two groups in any dimension of the SF-36 questionnaire (table 5). Similarly, no differences in treatment effect were found in the four performance tasks measured (Trails B, digit span forward, digit span backwards and digit symbol substitution). Of the three metrics analysed in the psychomotor vigilance test, only the mean of the slowest 10% of reaction times showed a significant difference between treatments, favouring BVS (p = 0.03). Following 3 months of treatment, 30 patients were found to have a good response to nocturnal CPAP and were recommended to continue with this treatment long term. Four patients in the CPAP group and two in the BVS group continued to show oxygen desaturation in REM sleep despite control of upper airway obstruction and were recommended BVS as long-term therapy. This study compared the impact of CPAP and BVS on clinical outcomes in a subset of patients with obesity hypoventilation syndrome without severe CPAP resistant nocturnal hypoxaemia. While both CPAP and BVS have been used to treat obesity hypoventilation syndrome previously, this is the first study to compare the two modalities in a randomised fashion. Using daytime Paco2 as the primary outcome measure, we found no significant treatment effect differences between the two forms of positive pressure therapy, with both groups experiencing a significant fall in Paco2 with a mean difference of 1 mm Hg between groups. Likewise, no significant treatment effect differences could be found between groups with respect to weight loss, compliance with therapy or daytime sleepiness, with both groups experiencing similar improvements with treatment. The BVS treated group reported better subjective sleep quality and performed slightly better on a psychomotor vigilance task than the CPAP group. However, the clinical significance of these small differences is unclear. Both groups experienced significant improvements in the Vitality dimension of the SF-36, while the BVS group also had significant within-group improvements in three other dimensions. However, no between-group differences were seen. There are limited data on the clinical outcomes following the introduction of positive airway pressure therapy in patients with obesity hypoventilation. Currently, around 11% of patients with obstructive sleep apnoea presenting to sleep laboratories are likely to be hypercapnic.3 However, with the increasing prevalence of obesity in the general population, it is likely that these numbers will increase. With a move towards limited diagnostic monitoring and automated titration of obstructive sleep apnoea, it is possible that some patients with obesity hypoventilation syndrome, particularly those with less severe nocturnal hypoventilation and without overt signs of cardiorespiratory failure, may be treated initially with CPAP alone. Laboratory titration algorithms for PAP therapy in obesity hypoventilation syndrome have fairly uniformly suggested commencing in CPAP mode, with a switch to BVS if persistent desaturation below 88–90% occurs in the absence of apnoeic events.8 13 16 In most centres the titration and decision about ongoing therapy is based on a split night or single night titration. This study was undertaken to understand better the short-term consequences of maintaining patients with obesity hypoventilation syndrome on CPAP, especially if a complete response to CPAP was not achieved during the initial titration study. To our knowledge this is the first study to randomly assign patients with obesity hypoventilation syndrome to either CPAP or BVS to determine if there is a difference in the longer term in daytime hypercapnia or clinical outcomes between these two therapies, albeit in a specific subgroup of patients. One previous randomised crossover trial has investigated the impact of 6 weeks BVS in a spontaneous/timed mode (BVS-S/T) to BVS-S/T with average volume assured pressure support (AVAPS) in 10 patients with obesity hypoventilation syndrome failing initial CPAP therapy.17 Both forms of BVS were found to improve oxygenation, sleep quality and HRQL, with AVAPS providing a more efficient reduction in overnight Tcco2 than standard BVS-S/T. However, the lower carbon dioxide level during sleep did not translate into further clinical benefits with regard to sleep quality or HRQL. Interestingly, during both forms of BVS, desaturation index, arousal and hypopnoeas remained raised and were not different from that seen during the CPAP night. Therefore, despite significant residual sleep breathing events on BVS, substantial clinical improvements in these patients were achieved. It could be argued that using a BVS mode with a back-up rate may have yielded more significant differences between CPAP and BVS therapy in our study. However, using BVS in a S/T mode does not guarantee complete resolution of respiratory events or normalisation of sleep quality, with patient-ventilatory asynchrony or periodic breathing reported to occur frequently in stable patients with obesity hypoventilation syndrome using this mode.18 The longer term consequences of an incomplete response to either CPAP or BVS, especially during the initial titration night, warrant further investigation. In this study, patients reported severely impaired health status before treatment. Significant within-group improvements in Vitality scores occurred with both forms of short-term PAP therapy. Significant within-group improvements in other health dimensions were seen only in patients randomised to BVS (Physical functioning, Role-physical and Social functioning). However, significant between-group differences following treatment could not be demonstrated, probably due to the wide variability in responses and small study numbers. For many individuals, irrespective of the treatment used, quality of life scores following treatment still remained significantly below that reported in a previous study of patients with obesity hypoventilation syndrome following 3–6 months of CPAP therapy.11 As the patients reported here were massively obese with a mean BMI of around 52 kg/m2, this failure to normalise SF-36 dimension scores is not surprising and almost certainly is due to the presence of other co-morbid conditions.5 Use of a more disease-specific instrument may have identified more subtle differences between the two treatment groups not identified in a general tool like the SF-36. Future studies should address more fully quality of life issues in this population and the impact of different PAP therapies on health outcomes. Compliance is obviously an important component of treatment success, and this in turn relies on patients’ tolerance of the treatment and the benefits they feel they derive from it. It has previously been argued that BVS may be more comfortable than CPAP because the patient exhales against a lower mask pressure,19 and this would result in greater adherence with treatment. However, this has not been shown in obstructive sleep apnoea,20 and the current study has likewise failed to show any difference in nocturnal use of treatment between the two therapies, with a mean nightly use of around 6 h for both groups. This suggests that, in patients with obesity hypoventilation syndrome with predominantly upper airway obstruction, the type of PAP therapy is not a major factor associated with treatment compliance. We arbitrarily reviewed patients after 3 months of treatment based on clinical practice.21 However, more recent data suggest that a 4-week period may be sufficient to achieve the full benefits of therapy with regard to changes in blood gases,7 16 irrespective of the type of PAP therapy used.16 Three months of treatment appeared to be a sufficient time period to allow improvements in nocturnal breathing such that a significant proportion of initial CPAP “incomplete responders” could be maintained on CPAP as long-term therapy. Other authors have also reported that a substantial minority of patients who initially require BVS could be maintained out of respiratory failure by the long-term use of CPAP therapy.7 22 However, for other measures such as quality of life and neurocognitive function, it is possible that longer periods of time may be needed to achieve improvements and future research would need to address this issue. A major limitation of this study is that the results are applicable only to a subset of patients with obesity hypoventilation syndrome—that is, those without severe persisting hypoventilation during initial CPAP titration. This limits the applicability of the findings to the entirety of subjects with obesity hypoventilation syndrome. However, at the time of commencing this study there were safety concerns about continuing CPAP when severe sustained nocturnal hypoventilation persisted. Earlier data had indicated that untreated hypercapnia was associated with a fourfold increase in mortality among the severely obese.6 We therefore believed it would be inappropriate to continue CPAP in those patients who continued to experience sustained severe oxygen desaturation or large rises in carbon dioxide despite control of upper airway dysfunction. However, the findings of this preliminary study have shown that the short-term use of CPAP in patients with obesity hypoventilation syndrome, even in those in whom nocturnal gas exchange and breathing abnormalities are not completely corrected during the first night of therapy, does not result in clinically significant differences in outcome compared with those placed on BVS. The patients currently reported had a high incidence of concomitant obstructive sleep apnoea in addition to their sleep hypoventilation. While this seems to be the case for the majority of patients with obesity hypoventilation syndrome,23 24 the results of this study cannot be extended to patients with obesity hypoventilation syndrome presenting with purely sleep hypoventilation. Therefore, until results from larger randomised clinical trials in patients with obesity hypoventilation syndrome with more severe sustained nocturnal hypoventilation are available, initial intervention with BVS with the possibility of transfer back to CPAP in the longer term would appear to be a reasonable and safe approach to treatment in this patient group.25 In addition, the sample size used in this study would be insufficient to detect differences in carbon dioxide changes occurring between the two groups. However, there are currently no data to determine what is a clinically important change in daytime carbon dioxide in this population. Future studies would need larger sample sizes to examine more subtle differences between treatments and to follow subjects over longer time periods to determine the impact on HRQL and hospital admissions. Further discussion and outlining of study limitations are included in the online supplement. In conclusion, we have shown that both nocturnal CPAP and BVS are equally effective in improving gas exchange in selected patients with obesity hypoventilation syndrome without initial severe persisting nocturnal hypoxaemia, with no differences between treatments in weight loss, daytime sleepiness or compliance over a 3-month period. However, patients treated with BVS had significantly greater improvements in subjective sleep quality and reaction time compared with the CPAP group. The results of this study open the way for larger trials that include patients with more severe nocturnal hypoventilation in order to better define the role of CPAP and BVS in patients with obesity hypoventilation syndrome, not only in the initial management of the disorder but also in the longer term. The study protocol was approved by the institutional review board of the Central Sydney Area Health Service (protocol no. X03-0022) and written informed consent was obtained from all patients prior to entry into the study. The authors thank the staff of the Sleep Disorders Unit for their care of the patients and each patient for their participation in this study. They also thank Dr Keith Wong for his statistical advice.
. Snoring and sleep apnea. A population study in Australian men. Am J Respir Crit Care Med 1995;151:1459–65. .Daytime hypercapnia in adult patients with obstructive sleep apnea syndrome in France, before initiating nocturnal nasal continuous positive airway pressure therapy. Chest 2005;127:710–5.
. Prevalence of sleep apnea and electrocardiographic disturbances in morbidly obese patients. Obes Res 2000;8:262–9.
. The use of health-care resources in obesity-hypoventilation syndrome. Chest 2001;120:377–83.
. Obesity-associated hypoventilation in hospitalized patients: prevalence, effects and outcome. Am J Med 2004;116:1–7.
. Short-term and long-term effects of nasal intermittent positive pressure ventilation in patients with obesity-hypoventilation syndrome. Chest 2005;128:587–94.
. Obesity hypoventilation syndrome as a spectrum of respiratory disturbances during sleep. Chest 2001;120:1231–8.
. The obesity hypoventilation syndrome can be treated with noninvasive mechanical ventilation. Chest 2001;119:1102–7. .Remission of severe obesity-hypoventilation syndrome after short-term treatment during sleep with nasal continuous positive airway pressure. Am Rev Respir Dis 1983;128:177–81.
. Nasal continuous positive airway pressure improves quality of life in obesity hypoventilation syndrome. Sleep Breath 2003;7:3–12.
. Obesity hypoventilation syndrome: hypoxemia during continuous positive airway pressure. Chest 2007;131:1678–84.
. Failure of CPAP therapy in obstructive sleep apnoea syndrome: predictive factors and treatment with bilevel-positive airway pressure. Respir Med 1998;92:208–15.
. Dangerous hypoxaemia during continuous positive airway pressure treatment of obstructive sleep apnoea. Lancet 1983;2:1429–30.
. Randomised trial of CPAP vs bilevel support in the initial management of patients with obesity hypoventilation syndrome. Sleep and Biological Rhythms 2006;4(Suppl 1):A11.
. Impact of adherence with positive airway pressure therapy on hypercapnia in obstructive sleep apnea. J Clin Sleep Med 2006;2:57–62.
. Average volume-assured pressure support in obesity hypoventilation: a randomized crossover trial. Chest 2006;130:815–21. .Respiratory patterns during sleep in obesity-hypoventilation patients treated with nocturnal pressure support: a preliminary report. Chest 2007;131:1090–9. .A management guideline for obesity-hypoventilation syndromes. Sleep Breath 1999;34:131–8.
. Continuous versus bilevel positive airway pressure for obstructive sleep apnea. Am J Respir Crit Care Med 1995;151:443–9. .Effects of short-term NIPPV in the treatment of patients with severe obstructive sleep apnea and hypercapnia. Chest 1994;105:434–40.
. Analysis of withdrawal from noninvasive mechanical ventilation in patients with obesity-hypoventilation syndrome. Medium term results. Arch Bronconeumol 2003;39:292–7. .The obesity hypoventilation syndrome. Am J Med 2005;118:948–56.
. The obesity-hypoventilation syndrome revisited: a prospective study of 34 consecutive cases. Chest 2001;120:369–76. .Positive airway pressure titration in obesity hypoventilation syndrome: continuous positive airway pressure or bilevel positive airway pressure. Chest 2007;131:1624–6. The positive pressure devices used in this study were supplied by Air Liquide, Alexandria, Australia and Mayo Healthcare, Rosebery Australia. These companies were not involved in the design, data collection or interpretation of the findings of this study. AJP has received travel support and lecture fees from Weinmann, Germany. RRG has received travel and equipment support from Respironics, USA. These authors’ sleep laboratory has also received an industry-sponsored project grant from ResMed, Australia. AJP was supported by a NHMRC (Australia) Health Professional Research Fellowship and RRG by a NHMRC (Australia) Practitioner Fellowship and the NHMRC CCRE for Respiratory and Sleep Medicine. Thorax 2008; 63 387-387 Published Online First: 28 Apr 2008.